Making your home “smart” doesn’t necessarily have to break the bank, but it definitely will if you spend a ton of cash on Philips Hue smart lighting. It’s great, but there are much less expensive options out there. 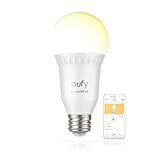 Take the Eufy Lumos Smart Bulb by Anker. These great LED bulbs provide all the same features as Philips Hue’s smart bulbs, and they even work with Alexa and Google Assistant. They don’t need a hub though, and they’re on sale right now for just $13 a piece. Amazon Alexa and the Google Assistant-compatibility means illuminating your home is as simple as saying “Alexa, turn on the living room lights.” or “Ok Google, turn on the living room lights.”. Lumos is the modern “light switch” activated by your voice. Whether it’s setting the lights to wake you up in the morning or timing them to signal dinner is done cooking, lighting schedules illuminate your life. And when you’re out, Away mode intelligently lights the house to simulate activity inside. eufy’s smart bulbs are meant to illuminate everyone’s life, so giving permission to other users to adjust the lighting is as simple as accepting a request from another EufyHome account. Revoke access at anytime. At eufy, we believe in our products. That’s why we back them all with a 18-month warranty and provide friendly, easy-to-reach support.